Geoff Turnbull and Joel Pringle explore the 19 March 2014 Millers Point sale announcement by Minister Goward. The media release said that 293 properties in Millers Point and Gloucester Street and the Sirius building in the Rocks would be sold “due to the high cost of maintenance, significant investment required to improve properties to an acceptable standard, and high potential sale values”. While the heritage properties may be covered in part by the first two reasons the decision to sell the Sirius building which was purpose built public housing for aging in place was solely for its “high potential sale value”. Public tenants, promised the opportunity by Land and Housing Corporation to comment on the Millers Point: Social Impact Assessment before any decision was made, only saw it and the Governments 5 page Millers Point: Government Response to Social Impact Assessment (PDF) dismissing a number of the recommendations, after the Minister’s announcement. The decision has broad ramifications for public housing in areas with high sale values. For the first time to our knowledge, fit for purpose public housing is being sold off purely because of how much it will bring in the private market. For years the government has argued the need for social mix throughout the city and now one of the areas where there is a mix is to be cleansed of all public housing. One of the issues that emerged after the announcement was the way the Minister handled the media reporting and how it misrepresented how public housing operates. While the media release was readily available it was some time before details of the kit supplied came to light. The Minister’s slick media kit said that NSW Taxpayers were paying rental subsidies as high as $44,000 a year in Millers Point. It contained case studies of heavily “subsidised” tenants designed to turn the community against the Millers Point tenants – in one case claiming “the total subsidy received across two generations was $528,000”. There are no subsidies paid to tenants, these “subsidies” are an internal accounting calculation of the difference between the rent being paid by a public tenant and what the property would rent for in the open market. The bulk of the properties cost the public housing provider nothing as ownership of waterside worker housing had been transferred to it from the Maritime Services Board in the 1980s. If applied to any public housing in a desirable area a high “subsidy” would be “paid” by comparison to those in Campbelltown, Gosford, Mount Druitt or Minto which the Minister used for comparison. 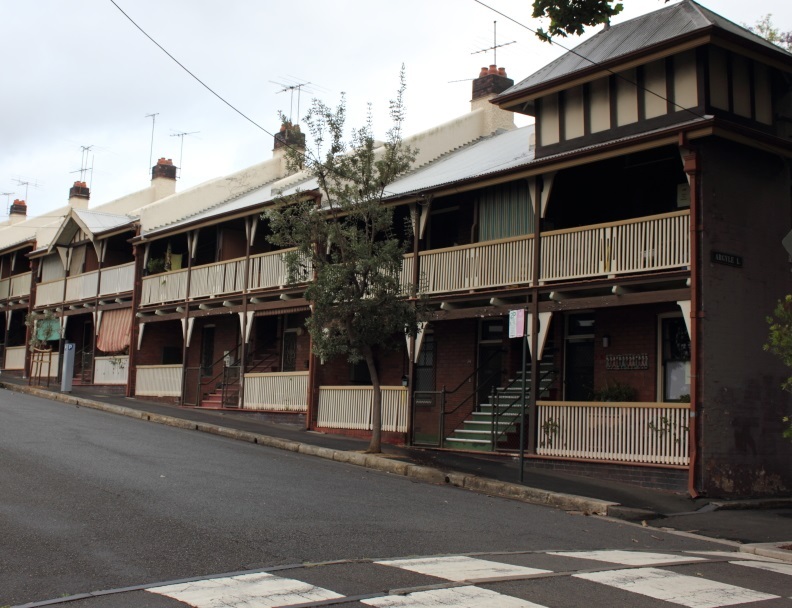 It is not surprising that public housing tenants in the increasingly desirable inner city fear that the Millers Point “logic” could be used next to move them out of their homes. You can read more about the “subsidies” on the Tenants Union blog the Brown Couch. The Ministers reference that for the “subsidy” paid for a single tenant in Millers Point they could subsidise up to five tenants in Wollongong was not a promise to put the proceeds of the sales into new housing stock in such places. The Minister was repeatedly pressed on this and she refused to commit to the proceeds going to new stock. No, the proceeds from Millers Point will become part of the depletion rate of public housing over the last decade that has seen 2.5 properties a day sold to pay the operating cost of running an underfunded public housing system. The sales will decrease public housing stock and make it even harder for those 57,000 on the waiting list to get into public housing and in the process it will disrupt long established communities like Millers Point. The sales are forced by a false logic that says that Government should not contribute to the cost of public housing and that it should be fully funded through rents. Changes to the Governments allocation policy made public housing into “housing of last resort” and almost totally did away with full rent payers making it financially impossible for the system to be funded viably by those on welfare. The Millers Point media kit not only advanced the “subsidy” argument, it set times to show the media houses in bad repair with itemised repair bills presumably with no commentary as to how the lack of government maintenance had contributed to the problem. They also provided before and after shots of houses previously purchased on 99 year leases. Photos of the newish public housing in Pyrmont or Lilyfield that tenants could be moved into was also provided as well as case studies of recently relocated tenants. Not to miss the marketing potential of the announcement the FACS website had a prominent link on its home page for potential buyers to register their interest in buying Millers Point properties. It is unlikely that any of FACS regular visitors could avail themselves of this real estate opportunity. The way the media was fed the story has raised concerns among tenants and advocates alike. Rather than help the community understand some of the problems in the state’s public housing system that need to be fixed by the government, the announcement demonised Millers Point public tenants as somehow rorting the system by being paid huge subsidies. While the immediate announcement impacts those in Millers Point and The Rocks it also has wider ramifications for the sector that requires a far broader response. A Rubicon was crossed when the Government decided to move public housing tenants out just because they lived in a desirable area. It says we should not have public housing throughout the city, only in the cheapest areas. The sector, other public tenants and those concerned about equity and fair play have to stand behind the Millers Point public tenants before the “logic” removes public housing bit by bit across the entire city.